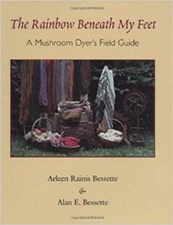 Bessette, Arleen Rainis and Alan Bessette: The Rainbow Beneath my Feet: a Mushroom Dyer’s Field Guide, Syracuse University Press, Syracuse, NY, 2001. If you are only going to purchase one book, I recommend this one as the best combination of field guide to identifying dye mushrooms and manual for procedures. Other books go more into depth in the processes, while Arleen approaches the subject from the viewpoint of the mushroomer also interested in fiber arts. Others are fiber artists with less knowledge of mycology. Rice, Miriam and Dorothy Beebee (illustrations): Mushrooms for Color, Mad River Press, Eureka, CA, 1980. One of the original publications on this subject by Miriam Rice that started the whole modern movement. The book is now out of print and demanding very high prices on Amazon. An earlier version called "Let’s try mushrooms for color" (Thresh Publications, 1974) is asking even more outrageous prices. The book is still very valuable as a reference source. In particular, it contains directions for mordanting silk with other mordants besides alum. Rice, Miriam and Dorothy BeeBee (illustrations): Mushrooms for Dyes, Paper, Pigments & Myco-styx, Mushrooms for Color Press, Forestville, CA, 2007. Amazon lists this book as out of print and unavailable, but a limited number of copies from a recent reprinting may be available still from Fungi Perfecti (and for much less than the Amazon listing at the time of this writing). See www.mushroomsforcolor.com for information and link. 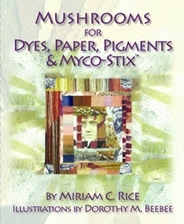 This is the last book by Miriam Rice before her death, and it contains much more about the chemistry of the process and about other ways to use mushrooms for color in addition to dyeing with them. According to Dorothy Beebee, the intent is to keep it in print by financing each printing with the income from the previous printing. 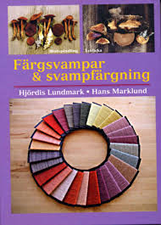 Lundmark, Hjördis and Hans Marklund: Färgsvamper & svampfärgning, Motagg Bokforlag, Sweden, 2009. Self-published in 2009 and only available in Swedish at present, this book nevertheless contains much information understandable from pictures alone. (An English translation of the title would be “Dye mushrooms and dyeing with mushrooms”.) The Scandinavians and in particular the Swedes have taken this art to new levels, especially in the understanding of its chemistry. 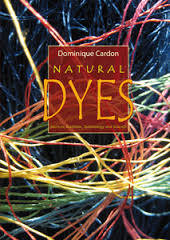 Cardon, Dominique: Natural Dyes: Sources, Tradition, Technology and Science, Archetype Publications Ltd., London, 2007. Translation by Charlotte Higgitt from Le monde des teintures naturelles (Paris, 2003: Editions Belin). 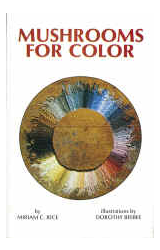 Definitive tome on natural dyeing, with history, information on the processes, specific materials and the chemistry involved. Expensive but thorough, the book is interesting to browse even if you’re only using mushrooms. http://www.mushroomsforcolor.com/ Dorothy Beebee’s website for the International Mushroom Dyeing Institute, this contains much information on the history of Miriam Rice’s experiments, current information about the International Fungi & Fiber Symposium held every two years in different places all over the world, and links to information on other upcoming events related to mushroom dyeing. http://www.sonic.net/~dbeebee/ Dorothy Beebee’s earlier web site with some interesting information on past IFF symposia and the history of mushroom dyeing. http://hookedanddyed.com/ is Myra Beebee’s blog. A good read, it has a lot of interesting information on experiments with mushroom dyeing by Myra and her mother Dorothy. http://www.lystickan.se/index.html Hjördis Lundmark’s home page. This site is fun to browse even if you don’t read Swedish. http://rbg-web2.rbge.org.uk/celtica/fungi/dyes.htm#fomentarius has some interesting information and pictures on the use of fungi in Scotland for dyeing. The page one level up has information on other uses of fungi in Scotland. http://earthguild.com/ Excellent source for dye-related chemicals and materials. Located in Asheville, NC, they are usually vendors at the Maryland Sheep and Wool Festival in Howard County, MD the first weekend of May every year. Online they carry mordants in bulk that The Mannings only carry in small jars. http://www.dharmatrading.com/ A good source of dyestuffs, chemicals, special detergents and fiber treatment chemicals, and especially silk fibers and garments for dyeing. It appears that the only mordant they carry for our purposes is alum. http://www.knitpicks.com/ Good source for a variety of yarns at reasonable prices for dyeing. http://www.alpacadirect.com/ Not just for alpaca products, this website has reasonable prices on yarns, roving and combed top. http://www.carolina.com/ Carolina Biological Supply is a good source for pH paper.